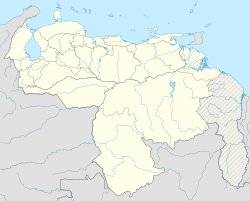 Barquisimeto (Spanish pronunciation: [baɾkisiˈmeto]) is a city in Venezuela. It is the capital of the state of Lara and head of Iribarren Municipality. It is an important urban, industrial, commercial and transportation center of the country, recognized as the fourth-largest city by population and area in Venezuela after Caracas, Maracaibo and Valencia. Barquisimeto was founded in 1552 by Juan de Villegas, as a headquarters and to have better control of the territory believed to be rich in gold. Its original name was "Nueva Segovia de Barquisimeto". This city had four settlements due to ignorance of the physical environment of the region. The first one was in 1552 nearby Buría River, but moved in 1556 due to frequent floods suffered by inhabitants. The second one was in the valley of the Turbio River where the city stayed until Lope de Aguirre burned it down in 1561. Its rebuilding was made 102 km (63 mi), but in 1562 they asked for permission to move to another site due to strong winds blowing in the place. Finally, Barquisimeto was located on the north plateau of the Turbio River in 1563. During the country's independence, Barquisimeto joined the liberation movement and its deputy José Ángel Álamo signed the Independence Act on July 5, 1811. In 1929, the city went through a modernization program carried out by General Juan Vicente Gomez. He fixed the streets and avenues and buildings were built, like the Jacinto Lara Headquarters, the Government Palace and the Ayacucho Park. According to the German adventurer Nikolaus Federmann, the Caquetío aborigines used to call it Variquicimeto, which translates as "ash-colored river", the name with which the natives distinguished the water stream near the city. This river was named "Turbio River" by the Spanish conquerors, a name that is still in use today. Another possible name origin is due to a red dye called bariquí. When Juan de Villegas founded it, he named the city "Nueva Segovia de Barquisimeto", but years later it became just "Barquisimeto", a word popularized by Oviedo y Baños in his book History and Conquest of the Venezuelan Population. It is known as the Dusk City due to its beautiful sunsets. The city's modern Barquisimeto Cathedral is the cathedral episcopal see of the Roman Catholic Archdiocese of Barquisimeto. Procession of the Divina Pastora. The Divina Pastora (Divine Shepherdess) is a statue of the Virgin Mary holding the infant Jesus, with a lamb at her side. It is considered to be one of the most important religious icons of Venezuela. Divina Pastora is the patron saint of the city of Barquisimeto and of the Venezuelan National Militia. The original image dates from 1735. Divina Pastora is celebrated in a procession on January 14 of each year, when a massive Marian procession occurs, considered to be one of the largest in the world, attracting thousands of pilgrims. The statue is removed from its shrine and is carried on the main streets of Barquisimeto in a procession which starts at the Iglesia de la Divina Pastora in Santa Rosa until it reaches the Barquisimeto Cathedral. This procession is unlike other mass Marian celebrations in the world, where the image does not leave its temple. This procession occurs due to the devotion the people of Barquisimeto have towards it as gratitude towards saving the city from a cholera outbreak that occurred in the city in the 19th century. In 2013, 3,000,000 faithful honored the Divina Pastora. Barquisimeto is located on the terrace of the same name, on the banks of the Turbio River, 622 metres (2,040 feet) above sea level and a population of 930,000 inhabitants. 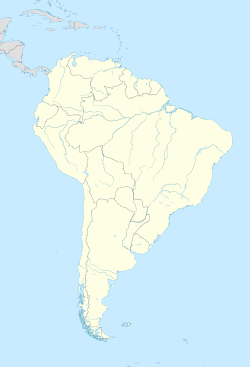 It has a location on the central western of Venezuela (363 km (226 mi) from Caracas, the country's capital city), being a point of convergence of many of the major land routes and rail, characterized also by its street order and appropriate signage due to the location of the city with a relief almost completely flat, which facilitated the distribution of the urban grid and with the streets numbered in ascending numerical order, factors that help the foreign citizen and easily locate addresses. Its climate is pleasant in the months of December to March, with an average temperature of 26 °C (79 °F) throughout the year. West: Jiménez and Torres Municipalities. In the city, a hot semi-arid climate (Köppen BSh) is dominant. Located in that region, Barquisimeto records 550 millimetres or 21.7 inches of rain per year and its average temperature ranges 25 °C (77 °F). However, in higher regions near the Andes, temperatures are lower and the rain is more constant. For instance, in Sanare city, the annual average rainfall is 835 millimetres or 32.9 inches. Mosaic Rectorate of the Universidad Centroccidental Lisandro Alvarado. Nuestra Señora de la Paz Sanctuary. Barquisimeto is a city with a historic vocation by academic knowledge, and boasts a considerable sample of universities and institutes of higher education in Venezuela, has a high and growing student population from all over the country. Major universities in the city include Universidad Centroccidental Lisandro Alvarado and Universidad Nacional Experimental Politécnica Antonio José de Sucre. The city has an airport called Jacinto Lara International Airport. The city is home to several notable baseball and football teams. Several other sports also have Barquisimeto as their home. ^ a b "Built-up urban areas by land area (urban footprint)" (PDF). Demographia. December 2016. Retrieved 4 June 2017. ^ "Estadísticos Básicos Temperaturas y Humedades Relativas Máximas y Mínimas Medias" (PDF). INAMEH (in Spanish). Archived from the original (pdf) on 15 June 2013. Retrieved 29 October 2012. ^ "Estadísticos Básicos Temperaturas y Humedades Relativas Medias" (PDF). INAMEH (in Spanish). Archived from the original (pdf) on 15 June 2013. Retrieved 29 October 2012. ^ "Barquisimeto Climate Normals 1961–1990". National Oceanic and Atmospheric Administration. Retrieved 12 August 2015. ^ Trolleybus Magazine No. 306 (November–December 2012), p. 148. ^ Trolleybus Magazine No. 311 (September–October 2013), p. 138. ^ Pérez Terán, Daniel (5 July 2013). "Ministro El Troudi: Transbarca debe estar terminado el 14-S" [Minister El Troudi: Transbarca must be completed on 14-S (14 September)]. El Impulso (in Spanish). Retrieved 9 August 2015. Wikimedia Commons has media related to Barquisimeto. Wikisource has the text of the 1911 Encyclopædia Britannica article Barquisimeto, Venezuela.